What is a Buddy Burner? A Buddy Burner is a simple stove made from a can and part of a corrugated paper box. It is usually fueled by paraffin wax but other fuels, such as boiled butter, animal fat or diesel fuel, can be used. It is usually used for cooking but can also provide heat. which is the height of the tuna can -- across the corrugations, so that the holes show. Roll the strips until the cardboard roll fits snugly into the tuna can. Melt the wax. It is best to use a double boiler, as if the wax gets too hot, it can burst into flame. You can improvise a double boiler by putting water in a large pan, and then setting a smaller pan into the water. Each tuna can will take about 4 ounces of wax. When the wax is melted, slowly pour it into the buddy burner so that it runs down into the holes and saturates the corrugated cardboard and fill the can to the rim. You can put a small piece of cardboard sticking up or a candle wick in the middle to help start it, but this isn't required. Let it cool and harden. First, cut out one end of the #10 can. Then cut a door about three inches high and four inches wide on a side of the can at the open end, leaving the top of the door attached. Pull the door open. Slide the cutout lid into the can, setting it firmly against the closed end. The following procedure will hold it there permanently, and the double thickness of metal will conduct the heat more efficiently. At the top of the stove (the closed end of the can) punch four smoke holes around the side with a punch-type can opener. The metal from the holes will hold the extra lid in place. Your stove is now complete. You will cook on the top of the can, either directly on it or by placing a pan on top of it, with the Buddy Burner underneath for the heat source. You can also use the Vagabond Stove without the Buddy Burner, using charcoal or a wood fire for the heat source. Set the Buddy Burner on a brick or concrete block (these get VERY HOT, so make sure you place them on something heat-proof). Put a lighted match in the middle of the can (or light the wick if it has one). The flame will spread across the top of the can; that's what it's supposed to do. It is also helpful to turn the can on the side so that the flame of your match can spread across the cardboard more easily. Once lit, place the Vagabond Stove over the Buddy Burner with the open end down. You can place a pan with whatever you want to cook on top of the Vagabond Stove or you can cook directly on top of it. If you need to regulate the flame, you can use a piece of aluminum foil (several thicknesses folded and slightly larger than the Buddy Burner) and place it partially over the flame in the can. To extinguish the flame, place the foil over the entire top of the can. If you need to bake something, you can use tuna cans as little pans. Place the food to be baked in the tuna cans, place on top of the Vagabond Stove and place another #10 can over that to form an "oven". Anything you would bake in a regular oven can be baked this way (if it is small enough). Each Buddy Burner should burn between 1-1/2 to 2 hours without needing to be refilled. They can be used for an indefinite period of time if they are replenished with wax though, because the wax burns at a lower temperature than the cardboard and lengthens the life of the cardboard. To refill the Buddy Burner, place small chunks of wax on top of the corrugation while it is burning. This is my version of a fantastic dish I tasted at the Princess d’Annam Resort & Spa, in Vietnam’s Binh Thuan province. The cooks grilled the scallops on a large barbecue set up on the beach. I love the small baby chickens that producers label spring chickens, poussins or coquelettes. The size – about 500 grams each – is just enough for one person. I learned to make nam jim jaew from a former domestic helper, who was from Isaan, Thailand. The sauce is addictive, and I sometimes make a double batch so I have a supply in the fridge, ready to perk up other types of grilled meat. if you are going to the effort of lighting up the barbecue, make it worth your while and cook as much as possible. This recipe calls for eight chops, and you can grill some eggplants to make a batch of babaganoush while you’re at it. Ready, get set … braai! THE first braai happened, so the theory goes when meat was accidentally dropped on to a fire by early hominids. One can imagine the intoxicating smell taking hold in the nostrils of the gathered group who would soon realise the delicious taste of grilled meat. We’ve evolved since then, with braais now involving all sorts of tools and rituals and rules. In the last few years South Africans have taken to celebrating our great braaing legacy on Heritage Day, September 24, because it usually falls within the first few days of warmer weather and also because, you know, braaing! If it’s your first time hitting the grill, or even if you’re a seasoned pro, here are a few tricks and tips that may help to make you the braai master to rule them all. One of the Best Comparison Videos Yet - Bar None. This is truly a change in grilling paradigms. Every place we have demoed the TurboGrill people have been amazed. Not only for the technological adaptation but the quality of the food it produces is astounding. We have made it easy for people to grill with very little concerned of wasting money burning their food, or the worst case...eating terrible tasting and potentially hazardous food. One of the worst things you could do is burnt, under-cooked food that could make your friends sick. Unparalleled design for instant satisfaction. By allowing the TurboGrill to rotate over the coals, from hot to cold zones, the TurboGrill not only keeps your food from burning, it allows food to cook very evenly and retain more moisture; creating a very succulent; crispy on the outside, moist on the inside, results. 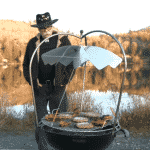 By allowing the food to rotate over the BBQ portable grill coals, from hot to cold zones, it not only keeps your food from burning, but retains more moisture and allows it to cook evenly on all sides. Result – crispy on the outside, moist on the inside; an unparalleled design for instant satisfaction. 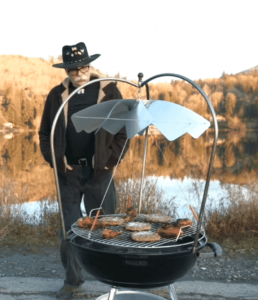 The TurboGrill is especially made to be a kettle BBQ grill enhancement that is compact and portable for entertainers, outdoor cooking enthusiasts, adventurers, nature lovers, foodies and others who simply enjoy good food without an expensive, restaurant style fit-out. Frank M., Design Engineer, commented, “As one of the first people invited to test the new TurboGrill backyard BBQ grill, I must say I was very impressed with the technology. The steak was really good and done to perfection – I devoured it. This innovative design allows for complete consistency in grilling skills, so take advantage of this technology during the company’s early launch. While the TurboGrills are already incredibly affordable, today’s discounts will not be available at a later date. 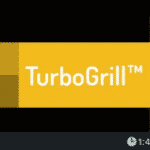 Visit www.turbogrill.us today, who guarantees that the TurboGrill will become a go-to for a lifetime of events. Stop burning food and start serving succulent, juicy favorites with ease.